Spring is here, with bright bursts of color appearing in the brown landscape. 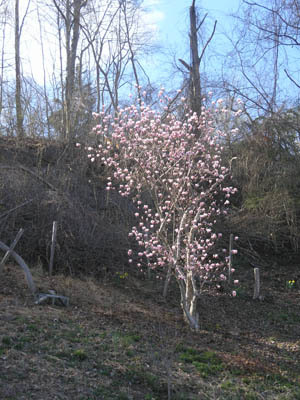 The hillside behind our house is still brown, but the saucer magnolia is sporting swelling ovals of pink and white, and the daffodil bunches are bright yellow, or white and salmon, and increasing in number as the catalog promised. A “naturalizing” variety, to be sure! The claims were true. Sunlight through the pink and white, with the yellow daffodils below. 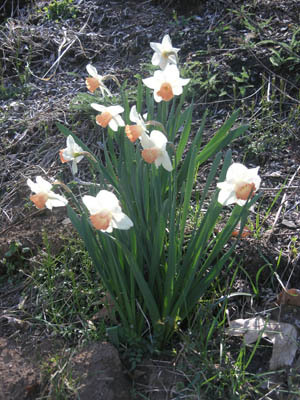 I planted our front slope with pink-only daffodils. When we first moved in, our hillside was covered with dead wild-rose canes, 4-5’ high, and we spent about 6 murderous weeks clearing it. Our reward was space to plant saplings and daffodil bulbs, and to discover the pretty rocks and periwinkle vines hidden beneath. The new growth reaches for the spring sun. 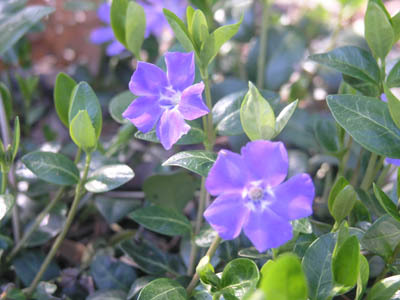 One of my favorite books has a chapter on periwinkles. The book is, sadly, out of print and what I wouldn’t give to have Interweave Press publish it once again. The book is by Sharon Lovejoy: “Sunflower Houses: Garden Discoveries for Children of All Ages.” It is a collection of projects, lore, and delightful illustrations, and would be the perfect gift for new parents, or new gardeners, or lovers of garden fairies (like me). 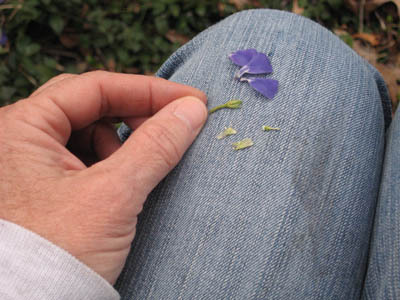 If you gently take off each petal of the periwinkle, and gently unwrap the outer wrapping of the pistil/stamen, you will see a wee paintbrush, perfect for tiny fairy hands, perfect to paint the flowers of the world. I think it is a charming story. 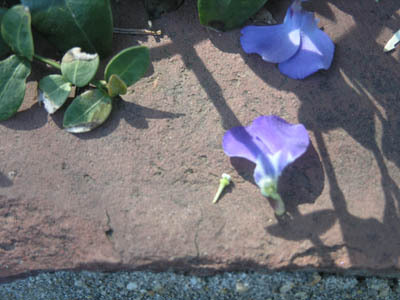 Here are a few photos of the periwinkle’s paintbrush. 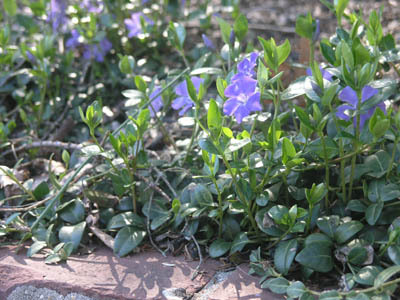 We are so grateful for the hard work of this modest flower and its tiny tiny brush that colors each spring. It looks as if a star fell into the center of the blossom. ...you find the tiniest fairy paintbrush, ready to color the flowers for spring. I’ll need to get my camera out, and photograph Assistant MacKenzie! Happy Easter to you!